Though the Vulture may not fit Dynaport’s standard design template, this series of ultralight frigates is actually produced by the same manufacturer responsible for the Titan and Albatross super-heavy freighters. Being the first of such smaller designs, the Vulture suffered a number of engineering setbacks and safety recalls. This mostly stemmed from Dynaport’s early attempts to miniaturize their Grav/Core compression technology into a frigate design. Not until the Vulture’s replacement, the Dynaport Eagle, was released did Dynaport resolve the myriad of issues. Despite being produced in a small batch and suffering so many catastrophic failures early on, a number of these models are still in use today. Many theories exist to explain this phenomenon. Some suppose the rare nature of the vessel inspired its owners to take better care of the ship for collector purposes. Others have assumed the early production quality was so varied that for every self-destructing vulture, at least one was built as reliably as the Titan series for which Dynaport is known. Whatever the case, the Vulture sees consistent use within both Banner and Red Star space. The higher-quality XL version of this vessel seems to have aged better than most other variants. This due in part to the superior-grade parts, but also because almost all hardware is interchangeable with the current-production Dynaport Eagle. 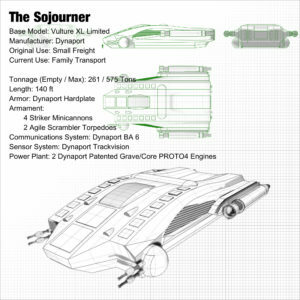 The Sojourner has the distinction of not only being an XL model, but also a Limited variety. Only six of these particular units were ever fully taken to production, four of which are still in operation. The Limited version sports an enhanced communications and sensor package, as well as larger side-mounted gun turrets. In fact, these gun turrets are some of the more unique features on the Vulture XL Limited. Striker Minicannons are a military-grade weapon emplacement, much stronger than the typical pirate-deterrent weaponry found on small-scale haulers. Even the newer Eagle class of vessel reverted to the Vulture’s standard weapon pack of dual Pike LRs. Although this makes replacement hardware difficult to acquire, the Strikers are by far the preferred weapon. The reason for the upgraded hardware isn’t abundantly clear from Dynaport’s literature, but since the Limited models were exclusively sold to affluent customers, VIP protection serves as a likely explanation. For many years, the Sojourner served as a drug-running ship captained by Madrid Valentino, the spoiled son of a Banner politician. After a drug bust and a subsequent police auction, the vessel became the property of William Dakota, a mechanic and used starship salesman. 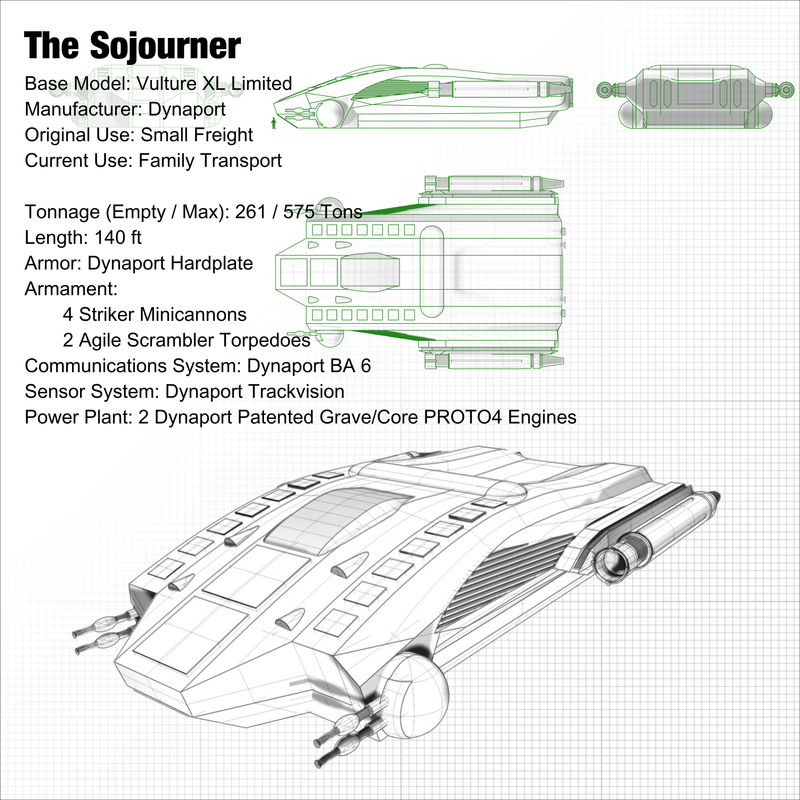 This is where the Sojourner took on its most unique characteristic among the already rare Vulture crafts. The Sojourner is completely wheelchair accessible. William refitted the interior living space in order to afford his handicapped niece better mobility. As of a month ago, William lent the Sojourner to his brother Michael so they could undertake a voyage to Elrich, the self-proclaimed medical capital of the galaxy. There, Michael and his family hope to find a cure to their daughter’s paraplegia. That is, as long as the aging Vulture doesn’t break down before they arrive.